Well, that didn’t take long. It took less than a week for the inevitable to happen. The duct tape stopped sticking and the right driver came loose, rattling about. That and the blue-tack holding the charging connector stopped tacking. I feel let down by the DIYer’s best friend. I used hotglue this time to hold the driver in place. I got some comments in Portuguese saying that there weren’t enough pictures of the process anyway. 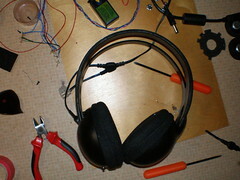 It’s a bit late now for that, but while I repaired the rattling I took some more pictures: flickr. We can also see the neat little on/off button. I didn’t even have to drill for it, it simply uses the hole for the old wire. Convenient. See my original post for details about the headphones.